The Hughes 5.50 Carat Round Bezel Set Cubic Zirconia Line Tennis Bracelet features 5.50 carats in total carat weight of high quality man made diamond simulants at a fantastic sale clearance price. 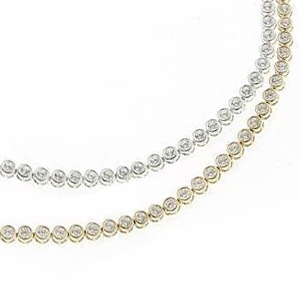 This 5.50 Carat Round Bezel Set Line Tennis Bracelet has cubic zirconia stones that measure 3mm in diameter which equate to approximately 12 points each. The solid 14k gold mounting is the same high quality bracelet mounting used to set real fine diamonds for the best possible finished product. This bezel set line tennis bracelet is great for casual wear but has contemporary design flair that it can also be worn for more formal affairs. The original Russian formula cubic zirconia that are set in this piece are all hand cut and hand polished to exact diamond specifications and include a lifetime warranty. 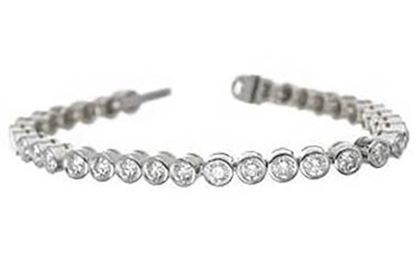 This round tennis bracelet has a male female style clasp system with a secondary safety double figure eight clasp. This tennis bracelet is a standard 7 inch length and is available in 14k white gold and 14k yellow gold, 18k gold and platinum versions can also be created via special order, simply contact us for a quote. Due to extremely low pricing, all clearance sales are final.